Born of humble parentage on July 25, 1923, in Belize City, Belize, Philip Goldson started life as a person of modest means and was able within his 78 years to soar above the various diverse circumstances that would govern his illustrious life. His early education was at St. Mary’s Primary School in Belize City, and he went on to study at night to successfully obtain the Cambridge University Overseas Junior Certificate in 1939, and the Senior School Certificate in 1941. 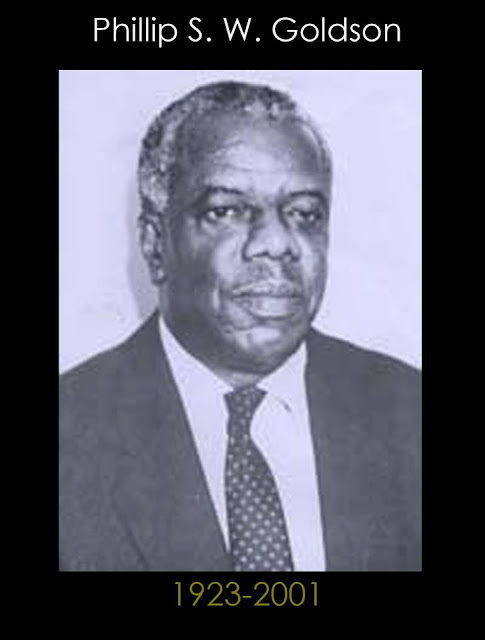 Political career: After working briefly as a civil servant for six years, Goldson became enticed by the beginnings of the Nationalist Movement in Belize of the late 1940s and early 1950s. The route into politics at that time was by way of the labor movement, and in 1949 he became the National Organizer of the General Workers Union, and later General Secretary. Together with early activists like John Smith and George Price, he founded the People’s United Party (PUP) in 1950 and served as Assistant Secretary. Convicted of seditious intention in 1951, Goldson was sentenced to one year in prison. Differences in opinion caused Goldson to break with the PUP in 1956, becoming Party Secretary of the newly formed National Independence Party (NIP) in 1957, and Party Leader from 1961-1974. He served as Deputy Party Leader from 1979-1982 of the United Democratic Party (UDP), formed out of the NIP and two other parties in 1973. He formed and led his last political party in 1991. Late in his career, at the age of 51 in 1974, he began to study law, subsequently called to the bar at Lincoln’s Inn, London, and to the Belize bar the following year. Although blinded by glaucoma in 1978, Goldson remained active in politics and as a member of the House of Representatives up to 1998. He was known to always be an unpretentious and humble man, as a politician and statesman. In the 1984 elections he not only won his seat but also was able to celebrate the victory of his party, the United Democratic Party. In the new Government Mr. Goldson was appointed Minister of Social Services and served with distinction. As Minister he established the Family Court, the Belize City Urban Department, the Department of Women’s Affairs, the District Councils, Disabilities Service Division, and launched the Belizean Partners in Service to Belize, which inspired Belizeans in North America to establish the Consortium for Belizean Development in November 1985. In mid-1986 he became Minister of Labour and Social Services. His interest in disabilities led to his election in 1986 as President of the Caribbean association of the Disabled and in 1987 Vice-President of Rehabilitation International. When a new terminal building was to be built at the International Airport, the Prime Minister and Cabinet decided to rename the facility the Philip S.W. Goldson International Airport. It was fitting tribute to an outstanding Belizean citizen. Mr. Goldson accepted the honor with humility and announced he would retire at the end of his term to devote his time to writing, the law, and his work for the disabled. However despite his retirement, on January 13, 1992, he was instrumental in the formation of the National Alliance for Belizean Rights (NABR). * First Leader of the Opposition in 1969, as the Leader of the National Independence Party. * Re-elected to the Albert Division of Belize City from 1965 to 1993. * As Member for Social Services, coordinating the rebuilding of Corozal Town after Hurricane Janet in 1955. * Minister of Local Government, Social Services and Community Development 1984-1989. * Minister of Immigration, Youth Development and Human Resources 1993-1998. * Elected to the Belize City Council in 1974, 1977 and 1983. * The first Belizean statesman to speak before the General Assembly of the United Nations, when he addressed that body in 1967 on the Guatemalan question. 1989: The Philip S.W. Goldson International Airport named after him. 2001: Conferred with the Order of Belize for his patriotism and political work. 2008: Conferred with the Order of the National Hero (posthumously).